There are times in life when we are caught utterly unprepared: a death in the family, the end of a relationship, a health crisis. These are the times when the solid ground we thought we stood on disappears beneath our feet, leaving us reeling and heartbroken, as we stumble back to our faith.The Days of Awe encompass the weeks preceding Rosh Hashanah up to Yom Kippur, a period in which Jews take part in a series of rituals and prayers that reenact the journey of the soul through the world from birth to death. This is a period of contemplation and repentance, comparable to Lent and Ramadan. Yet, for Rabbi Alan Lew, the real purpose of this annual passage is for us to experience brokenheartedness and open our heart to God. 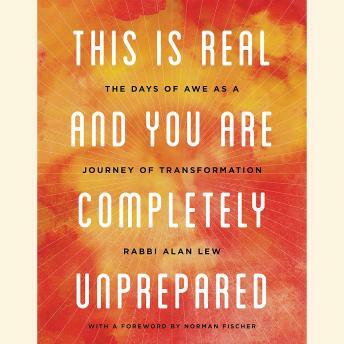 In This is Real and You Are Completely Unprepared, Lew has marked out a journey of seven distinct stages, one that draws on these rituals to awaken our soul and wholly transform us. Weaving together Torah readings, Buddhist parables, Jewish fables and stories from his own life, Lew lays bare the meanings of this ancient Jewish passage. He reveals the path from terror to acceptance, confusion to clarity, doubt to belief, and from complacency to awe. In the tradition of When Bad Things Happen to Good People, This Is Real And You Are Completely Unprepared enables believers of all faiths to reconnect to their faith with a passion and intimacy that will resonate throughout the year.